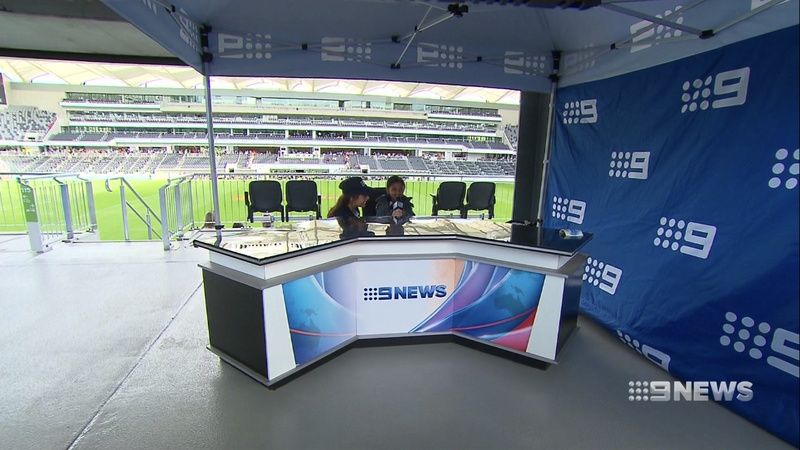 Nine were at the community open day at Parramatta’s BankWest Stadium yesterday, didn’t do a awful lot, just give away some stickers and allowed people to do a mock 9 News cross. I’ve done one at the cricket in the past. I did get a photo of the setup, but not of the 9 News “set” (at least, one without people sitting in it). Note that at the time this was taken, they had a Lego character in the getup promoting Lego Masters. Here is the sticker they were giving out. Will scan in tomorrow and upload here so people can play silly buggers with it. surely those stickers have hung around since the last time they did a promo out that way! No chance they’d be new. I did get a photo of the setup, but not of the 9 News “set” (at least, one without people sitting in it). As seen on Nine News on Sunday night. The Nine promotions news desk has made its way from Parramatta to Cronulla Mall for those keen on proving they can read the news better than Mark Burrows.